In 1000 years, America will have collapsed, but viral Internet content will still be alive and kicking. 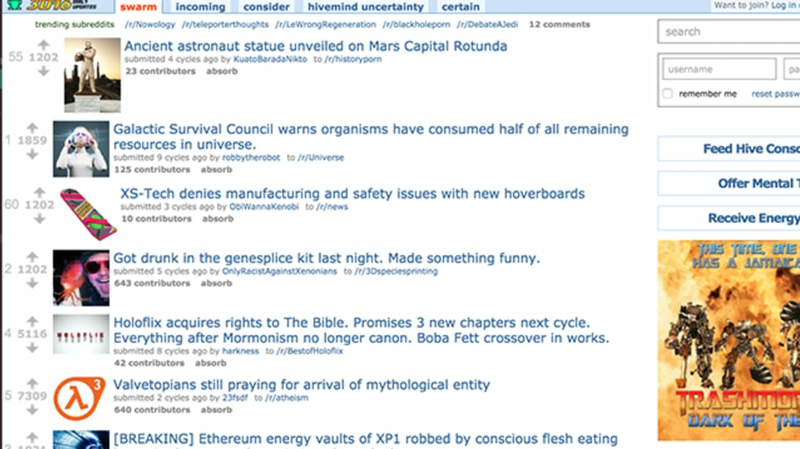 That’s the future imagined by Reddit 3016, an art project and detailed parody of the types of things people will always want to share. Blair Erickson, a San Francisco-based filmmaker and creative director, spent four years accumulating material for the site, according to Gizmodo. He wrote a number of articles for the future Huffington Planet, Photoshopped images to upload to Hologur, cut videos to run on MindTube, and brainstormed what kind of institutions would survive the “collapse of the Ancient American Empire in the 2030’s,” as the site foretells. Here’s the future we have to look forward to, according to Erickson: mansplaining will morph into maulsplaining, the Galactic Security Administration will probably be stealing secrets directly from your mind, and toilets will be a thing of the past. But people will still want to share conspiracy theories, wax nostalgic about their childhood, argue that they were into something before it was cool, and try to form romantic connections. Explore the site at reddit3016.com, and see more updates on a Reddit 3016 sub-reddit of the actual (2016) site here.